Before you can plant your tomato seeds, they first must be prepared properly, or they will not germinate. If you grow your own non-hybrid tomatoes, you can begin preparing your seeds for next year's harvest while you are eating the fruits of this year's harvest. Gathering the seeds from your own tomatoes is a great way to start a family tradition and save money on seeds from the garden center. If you purchase your tomato seeds, you may want to prepare them indoors as seedlings to get a head start on the growing season. Move on to section 2 if you have purchased your seeds and just need to prepare them in soil for transplanting outside in spring. 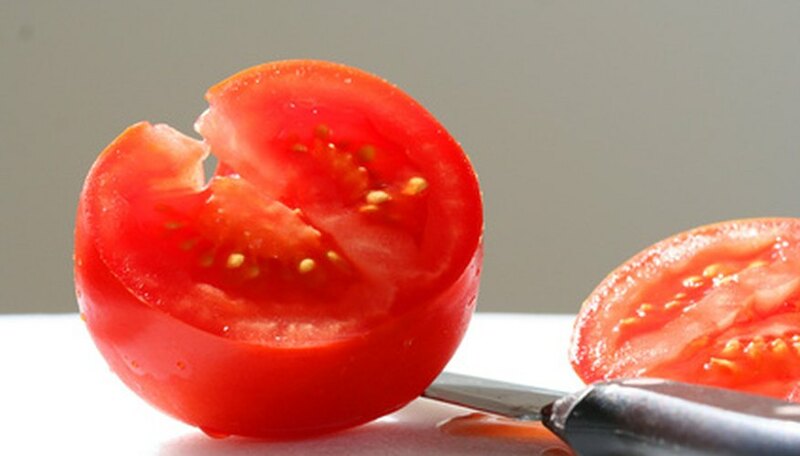 If you are harvesting your own seeds, cut a choice tomato in half across the middle, and take a spoon and scoop out the gel pulp and seeds into a bowl. Set the bowl of seeds and gel on a warm counter for up to five days, stirring the jar two times per day. As the seeds sit the tomato gel like pulp will begin fermenting. During this process, healthy, viable seeds will sink to the bottom of the bowl and worthless seeds will float to the top. Using a spoon, scoop the worthless seeds and fermented matter off the top of the bowl and throw it away. Add 1/4 cup of lukewarm water to the bowl. Again, seeds that are viable will go to the bottom, and any seeds that are left that will not germinate will float to the top. Let the seeds settle after adding the water, and then once again scoop off any seeds that are floating on the top. Dump the good seeds and water into a small sieve and rinse well under lukewarm running water. After rinsing, set the seeds out, in a single layer, to dry on paper towels. When dry, store them in paper envelopes and store them in a dry location until it is time to plant them. Start seeds indoors, six to eight weeks before the last expected frost date for your area. You will need a seed starter soil mix, three-inch peat pots, a plastic seed tray and a large clear plastic bag. Fill the peat pots with the seed starter soil mix and then set the pots in the plastic seed tray. Water them until the soil and the pots are both moist. Plant the tomato seeds 1/4 inch deep in the soil, and gently tap the dirt down over them. Cover the tray with a sheet of plastic wrap, or insert it into a clear plastic bag but don't seal the end. Set the tray in a warm area, such as on top of the refrigerator or a hot water heater. The seeds should germinate within seven to ten days, at which point you can remove them from the plastic bag and place them in a sunny window until it is time to plant them in the ground. Be sure to monitor the moisture content of the soil and peat pots while they are growing, keeping them moist but not wet. When drying the seeds, if you do not have paper towels you can substitute coffee filters. If you store your seeds before they are completely dry they may develop mold and rot. If you are not sure if they are dry, it won't hurt to leave them out for a few more days.